Hummingbirds are finicky eaters - they'll spit out plain water, and they won't settle for certain fake sweeteners like those found in diet soda, a new study in the journal Science shows. Instead, these little birds are all about slurping up sugary nectar, thanks to a refined palate that's genetically unique. Many birds, such as chickens, lack the taste bud receptors that sense sweet. Comparing the taste genes of hummingbirds to those of swifts and chickens, biologists at Harvard University found that hummingbirds don't have traditionally-defined sweet receptors, either. Plenty of animals have lost the ability to taste certain flavors over time. To a whale, everything just tastes like salt. And cats, as NPR notes, are "sweet blind," impartial to a spoonful of sugar. The cat genome still contains sweet-sensing genes - but these genes simply don't work. With birds, however, it's a little different: they have no sweet genes at all, at least in the same way as mammals taste sugar. (Our taste receptors are split into five, for bitter, salty, sour, sweet and umami, which is, essentially, savory). 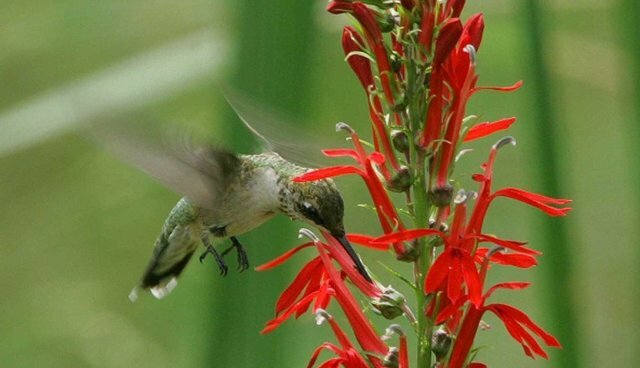 It was a puzzle that perplexed Maude Baldwin, a graduate student at Harvard University: "If they are missing the single sweet receptor," she says in a statement, "how are [hummingbirds] detecting sugar?" The trick to tasting sweet in hummingbirds, Baldwin and her colleagues found, was a mutation in the birds' umami receptors - it's as if these receptors jumped the rails from the savory to sweet track. "This is the first time that this umami receptor has ever been shown to respond to carbohydrates," Baldwin says. Chickens and swifts, on the other hand, rely on their umami receptors to taste savory amino acids, like those found in bugs. "The taste system is arguably a really direct line to pleasure and aversion, reward and punishment, sweet and bitter," says Harvard cell biologist Stephen Liberles, a co-author of the study. "Sensory systems give us a window into the brain to define what we understand about the world around us."